The sun shone, but it was bitterly cold (by California standards) this morning. I warmed up with a cup of rose hot chocolate (more about this in a few weeks) and a small handful of plain, raw almonds that served as a palette cleanser between chocolate courses. With that, I was ready to taste Fruition Chocolate's Dark Chocolate Coated Toasted Almonds with Smoked Sea Salt. If you're familiar with hickory smoked almonds, you'll recognize this flavor in today's chocolate. 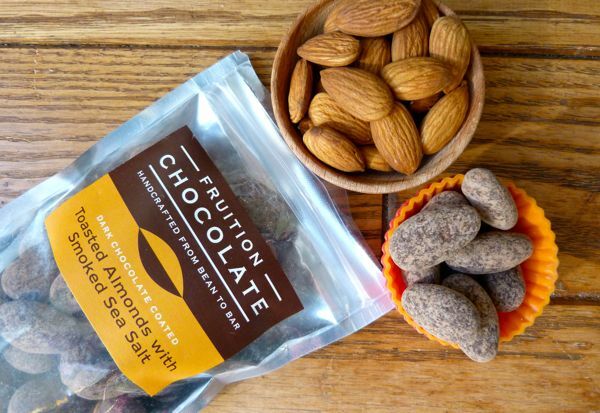 The smokey, applewood sea salt seasoning was the first taste to register, and it was a very pleasant complement to the (66% cacao) smooth dark chocolate (from Peru), and the crunchy toasted almond at the center of each piece.